Lyons Stonework, were appointed to repair and rebuild the parapets and pilasters of Shepley Bridge, Tameside. 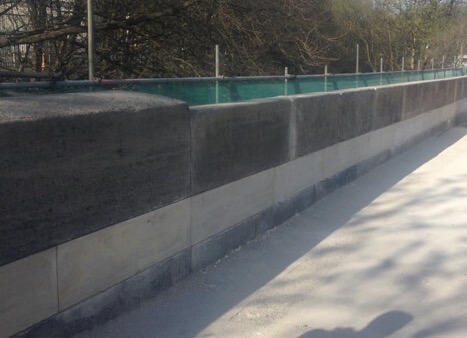 Lyons were appointed as masonry contractor for the repair and improvement works at Shepley Bridge on a supply and fix basis. The unique strength at Lyons is to offer a full in house solution for scheduling the stone, matching existing, fast turnaround cutting of the stone in house and a substantial site fixing team, making Lyons ideally placed for such works when road closures/restrictions are in place and time is of the essence. After undertaking careful assessments of the stones to be moved calculating individual block weights, a lifting plan and methodology for the works was established. The bridge parapet was stripped down and cleaned allowing the removal of self-seeding trees from the bridge. Whilst stripping the masonry was templated and scheduled and immediately sent into production. The first load of stone was on site ready to fix, thus raising the height of the parapet as specified upon completion of the takedown works. The parapet was refixed using resin fixed stainless dowels with the original stones sitting on top of the new. The works were completed within the agreed timeframes mitigating the affect on road users. Dismantling and rebuilding the parapet. Lifting and resetting of pilaster blocks weighing 4 tonnes each. Scheduling and templating for masonry to complete the bridge. Increase the height of the bridge parapet. Fixing of new masonry with substantial stainless steel dowels. Repointing of stonework with lime mortar.